Founded in 1967 by native Las Vegan Sam Nakanishi, Osaka Japanese Bistro was Las Vegas’ first Japanese restaurant. As a great new option in a town with few ethnic food restaurants, Osaka’s fresh, healthy food and authentic Japanese atmosphere made it the place to be for local notables and regular folks as well. Today, fans agree Osaka remains among the best restaurants in Las Vegas. Run today by Sam’s son, Gene Nakanishi, Osaka has earned recognition from diners and critics alike for the quality and freshness of its ingredients as well as the diversity and variety of its menu. The restaurant’s award-winning sushi chef, Shingo “Shin” Aihara, leads a team of talented Japanese-trained chefs in creating a memorable and delicious dining experience that qualifies Osaka to take its place in the ranks of Las Vegas best restaurants. Under the leadership of Aihara, a one-time National Sushi Competition Adjudicator in Japan, Osaka has been recognized and acclaimed by food critics and diners around the world as one of the best Las Vegas restaurants. The Asahi Shukan, Japan’s largest and longest-circulating weekly magazine, named Osaka among the 50 best Japanese restaurants in the world – the only restaurant outside of Japan included on the list. Famed internationally, Osaka is well-known and well-loved by locals as well. 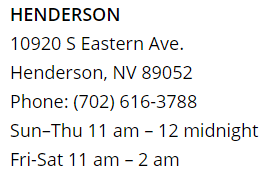 Both the Las Vegas and Henderson locations are favorite spots for a tasty lunch or a great late-night dining experience. The local newspaper, the Las Vegas Review Journal, has awarded its readers’ choice “Best of Las Vegas” honor to Osaka 20 times. 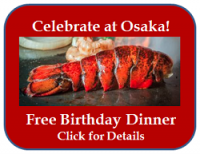 The basis for this enthusiastic praise rests with Osaka’s extensive and well-crafted menu and dining experience. Offering three Japanese dining styles–including a sushi bar, a teppanyaki grill and traditional tatami rooms–Osaka is designed to meet all of its diners’ Japanese food cravings. 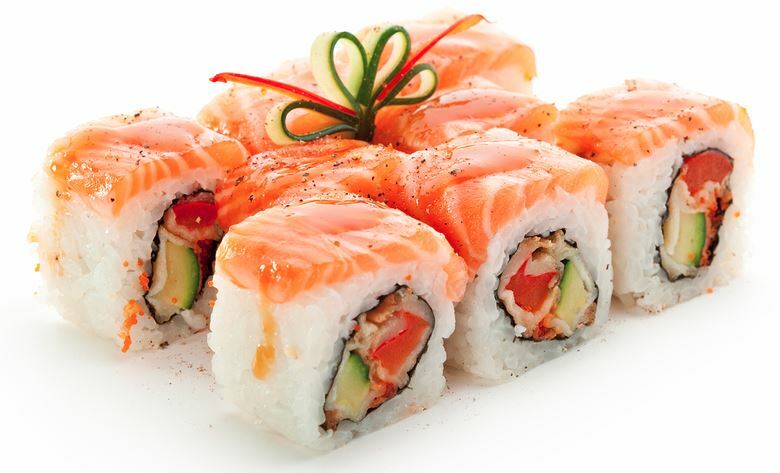 Osaka’s authentic dishes include over 30 appetizer options and 75 different sushi rolls. Befitting its stellar reputation, Aihara and his cooking staff use only the freshest ingredients based on seasonality to craft Osaka’s signature dishes, including sayori (halfbeak), awabi (live abalone), katsuo (bonita), kanpachi (rudderfish) aoyagi (live surf clams) and Blue Fin Toro. Many of these exotic ingredients are typically only found in Japan, and Osaka imports them to provide their sushi bar with the widest variety of any restaurant in Las Vegas. Family-run since its opening four decades ago, Osaka is not just one of the best restaurants in Las Vegas; the restaurant, its owners and its staff have also become an important staples of the local community. Having participated in numerous local charity events, Osaka is also a member of the Las Vegas Host Lions Club, a community organization dedicated to promoting volunteering and community pride. The Nakanishi family carries on its tradition of quality recipes and a passion for service that has sustained the popularity of Osaka with tourists and locals alike. Many return again and again to enjoy a delicious lunch or dinner, witness the cooking artistry at the teppan table, relax in a traditional tatami room or chat with friends at the sushi bar in a classic Las Vegas atmosphere. 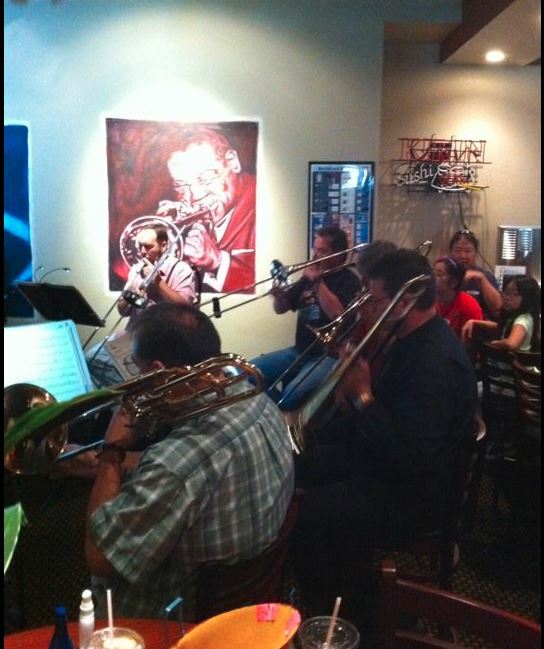 Patrons can choose between the historic, original restaurant location on West Sahara Ave, not far from the Strip, or to take in an evening of live jazz at the Henderson restaurant. 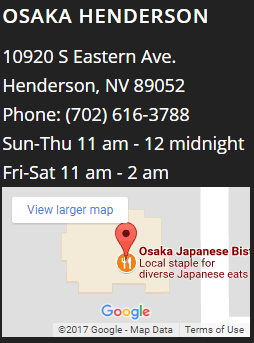 With its excellent ingredients, authentic menu and dedication to the community, it is easy to see why Osaka Japanese Bistro has become a premier destination and holds its long-standing place among the best Las Vegas restaurants. 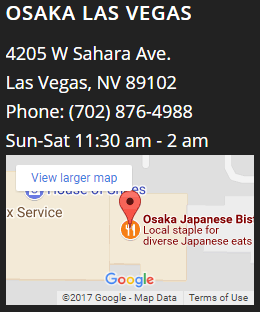 https://www.lasvegas-sushi.com/wp-content/uploads/2017/02/OSAKA-LOGO-300x130.png 0 0 Osaka Japanese Bistro https://www.lasvegas-sushi.com/wp-content/uploads/2017/02/OSAKA-LOGO-300x130.png Osaka Japanese Bistro2016-09-29 14:48:052017-04-12 09:43:53Looking for Best Restaurants in Las Vegas? Osaka is Still the Place to Be!